Among the relations of Charles de Lambert is the Compagnie Universelle du Canal Maritime de Suez in Paris. 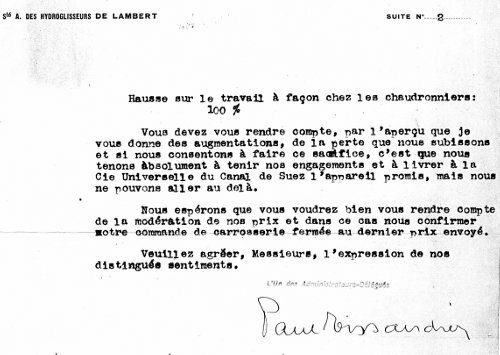 As for inspection on the Suez Canal faster machines are desirable on July 9 1914 its Comité de Direction decided to order a four-seater hydroplane “De Lambert” of the type Limousine. At the beginning of November 1915 the company informed that installation of either a cannon of 37 mm or of a machine-gun is possible. 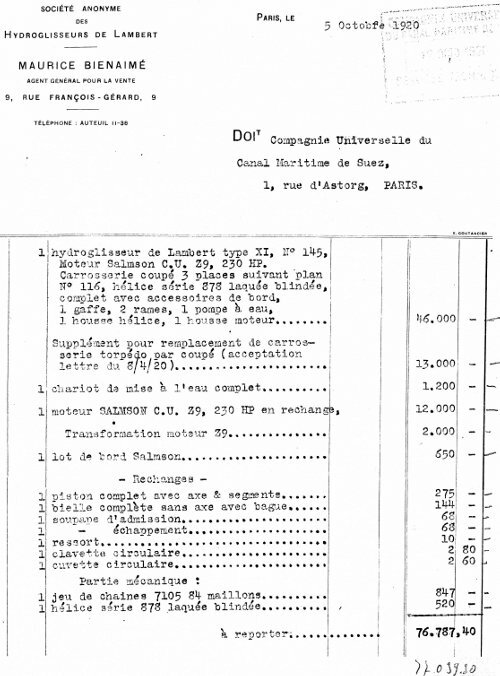 Evidently execution of the order has gone smoothly because for the total amount of about 77.000 French francs another hydroplane was supplied at the beginning of October 1920. Beforehand negotiating on the purchase price is (of course) also part of the game. 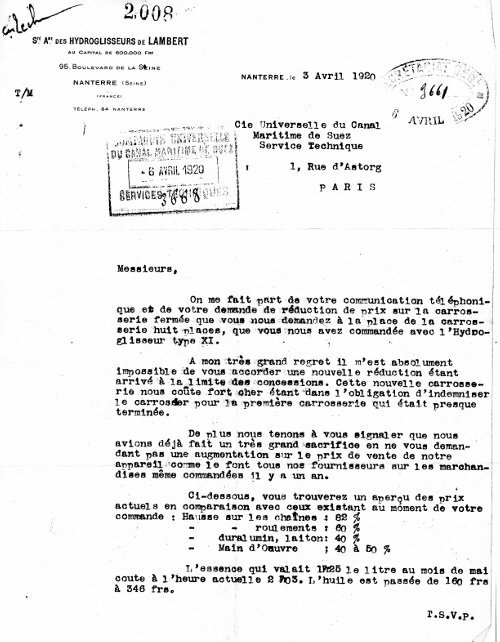 See the letter of April 3 1920 for the attention of the Service Technique. I have been informed of your telephone call and your request for reduction of the price of the closed cabin instead of the eight seat cabin, which you have ordered with us with hydroplane type XI. Much to my regret it is absolutely impossible for me to grant you another decrease because we have reached the limits of the concessions. This new cabin is very expensive for us because we have undertaken to indemnify the manufacturer for the first cabin which is almost ready. Moreover we would like to draw your attention to the fact that we already have made a very big sacrifice by not asking you for an increase of the selling price of our machine as all our suppliers are doing on the goods ordered even a year ago. Petrol worth 1Fr25 a litre during the month of May costs at present 2Fr03. The price of oil has increased from 160 frs to 346 frs. You are to realize, viewing the summary on the increases I am giving you, the loss we are suffering and, in case we would agree to make this offer, it is because we want to absolutely meet our obligations and to supply to Cie Universelle du Canal de Suez the promised machine, but we cannot do more. We hope you are willing to consider the moderation of our prices and in this case to confirm us your order on the closed cabin at the latest price sent.